Contrary to what you may think, not all lead magnets are created equal. This can be particularly challenging for entrepreneurs that work in passion-based industries. The reason being, most passion-based entrepreneurs are SOOOO knowledgeable and passionate about getting their clients the results they’re looking for, that they often BLOW THEM AWAY with knowledge. Sort of like killing a fly with a BAZOOKA … it’s too much! Let me tell you a little story. This is funny and a little sad, but what the heck, we all start somewhere. One of my first ever “official” lead magnets was put together back in 2010. At the time we had just celebrated 12 years in business and honestly, I was a little cocky. What people really need is somebody like me to come in and tell them the truth, lay it on the line and just stuff them full of killer content. So my idea was – 30 Tips in 30 Days. Each day, for 30 days, I was going to send an email with a quick tip, lesson or strategy. Just basically dropping knowledge. I started out strong … for the first week, then I missed a few days and got back on track. By the time I hit day 22, I was so sick of it that I didn’t even finish the 30 tips. The funny part though, was that not 1 person called me on it. So of all the people that had signed up, they lost interest between day 1 and day 22 and didn’t even notice that I didn’t finish writing the tips. That was a horrible lead magnet for a lot of different reasons. 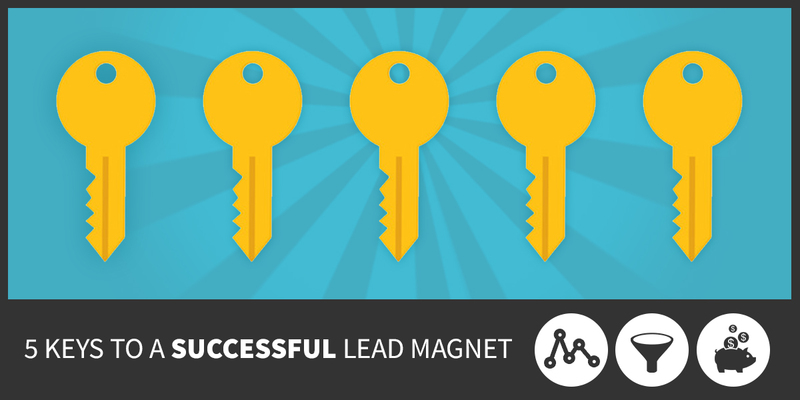 After many lessons learned and a lot of experience, we’ve come up with 5 KEYS or rules for lead magnets. Any lead magnet that we’ve ever seen flop (and we’ve seen our fair share), has been because it broke one of these rules. And without a doubt, if you’ve dipped your toes in the lead magnet world and they’ve been less than successful, you can undoubtedly point it back to one of these five. They aren’t complicated, but DO NOT underestimate the power of these rules. Specific – Our goal with this lead magnet is that we want to give the prospect a specific RESULT. Once they get that result, that’s when trust is built and when the relationship building starts. We’re not trying to solve ALL their problems. We just want to solve this one nagging problem because that will show them that we know what we’re talking about – we’ve solved this problem and we can definitely solve others as well. The more specific the better. Easy to Consume – Remember my 30 tips in 30 days … that was too much. Books make horrible lead magnets because they take too long to get through. Small e-books, checklists, short videos – these are all easy to consume. The other thing we want to take in account here is how your perfect client prefers to consume their content. If you’re people don’t listen to podcasts … don’t do a podcast – they won’t consume it. Address a Known Desire – By known desire, we mean a desire your perfect prospect has. Not what you think they have, but what they’ve told you they have. Deliver Value – Value can either be real or perceived. Real value would be like – Save $50 on your first week of xyz. Perceived value can be a webinar, some killer content or teaching somebody a skill. This one can be tricky because sometimes there can be a difference of perception in terms of value. Let me give you an example: When we launched our membership site last year, part of the offering was me being on an office hours call every week. From my perspective, this had immense value. An 18-year marketing veteran just sitting on the phone waiting to answer your questions. I know what my bill rate is and that was a lot of $$$$ that we were missing out on. My audience rarely took me up on it. More often than not, I was on the phone just working on client projects. The reason being, the audience either didn’t understand the value or they didn’t see the value – it wasn’t important to them. So when you are looking at value, look at it from your customer’s perspective, not yours. Aligned with your product or service – It doesn’t have to be directly related but we need to be able to connect the two through our follow-up sequence. Let me give you an example: I have a client that runs a doggie daycare and boarding facility. So the lead magnet that we worked on was a guide to local dog-friendly hikes and beaches. The target market was active professionals with dogs that were looking for fun outdoor activities they could do with their pets. What made this work, was that fact that we could tie their weekend excursions to exercise and how exercising their pets made them happier and healthier on the weekends. But during the work week, the dogs wouldn’t get the exercise that they needed when they were cooped up in the house all day, so we introduced some weekday exercise packages so their dogs could be happy and healthy all week long. BINGO! You see how that worked? We used the lead magnet to identify and call out our perfect customer. We had them pay attention to the dogs wellbeing when they were well exercised, and then simply reminded them that they don’t get that exercise during the week presently, but they could with one of our exercise packages. So those are the 5 Keys to a Successful Lead Magnet. They are the rules that we’re going to test all of our ideas against to help reduce the chances of us putting out a stinker. Use the comments section below and tell me a lead magnet that was successful for your business?